Aaron Taylor-Johnson, half my obsession, is featured in Mr Porter this month ahead of the release of his next film The Wall. I LOVE this interview. I LOVE how he speaks. But let me give you some background before I explain why. My husband, Jacek, and I run LaineyGossip together, with significant contributions from Emily, our site manager, and of course, all of our valued contributors. Given that the site is named after me, I am, for the most part, the primary voice of it. Jacek remains in the background. He works from home. He is the caretaker of our house. He handles the administration side of our business and the administration of our home. He does most of the cleaning. He does the maintaining. He looks after our dogs. He makes sure we have all our supplies. He takes tremendous pride in these responsibilities. But this, as you know, is not the “traditional” way a straight relationship works. And I’ve seen the judgment. Because a “man’s place” is not “domestic”. A few days ago on The Social, we interviewed Stephen Marche, who co-wrote a book called The Unmade Bed: The Messy Truth About Men And Women In The 21ST Century with his wife, Sarah Fulford, the editor of Toronto Life Magazine. Stephen and Sarah used to live in New York where he was a tenure-track professor. They moved to Toronto for Sarah’s job. So he gave up his career so that she could pursue hers. He is now the primary parent at home, looking after their children and their household. Stephen writes about perception, about how some people reacted to their decision, looked down on him for “lowering” himself to his new role, a role – mind you – that women have conventionally occupied. And that’s exactly the kind of thinking that perpetuates toxic male masculinity. As Stephen told us on the show, as he and Sarah have been doing press for the book, the interest in their story has come only from women. There are no men who want to talk about this. But men are the ones who would most benefit from reading about their experience. Back in January, the NY Times published an article on Why Men Don’t Want The Jobs Mostly Done By Women. As the job market is changing, there are actually more and more opportunities in caregiving industries. There is money to be made in those industries. And yet men are staying away from them. Because these jobs are “seen as women’s work, which has always been devalued in the American labour market” – work that requires sensitivity, thoughtfulness, and empathy…like those are gendered values? Secure and loved and safe. Remember those “gendered values”? How often do men talk about being in a relationship to feel “secure” and “safe”? Feeling “secure” and “safe” is important for anyone in a relationship, whether you’re a man or a woman. But these are not what men are encouraged to communicate. Because when you admit to needing to feel “secure” and “safe”, the fear there is that a man is weak if he’s on the receiving end of that exchange. A man is often seen as the one who PROVIDES those things, not the one who requires them. A man who can share that he too seeks security and safety in a relationship is the man who is stepping away from the constraints of toxic male masculinity, embracing the attributes that were once only acceptable in a woman. Imagine if more men could do the same? That’s not in the traditional playbook for a man. Just as it wasn’t in the traditional playbook for Stephen Marche to spend all that money and all that time getting all that education “only” to stay home with his children while his wife pursues her career. Which of course women have been doing for YEARS without the same kind of judgment. But this is what modern masculinity looks like. This is what we need to encourage more men to look like. 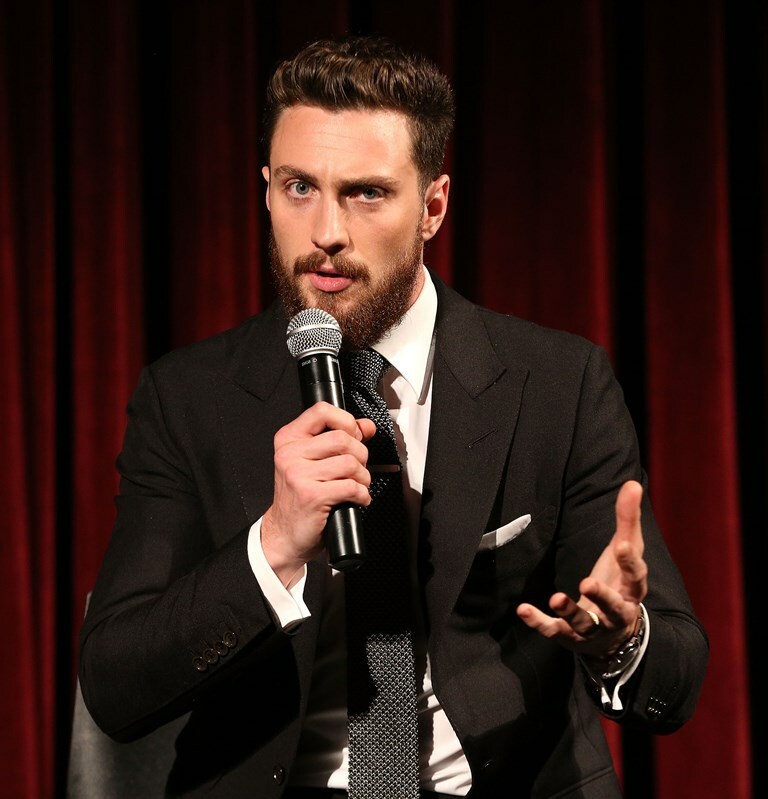 And it looks really, really good on Aaron Taylor-Johnson. Click here to see more pictures of him looking really, really good in Mr Porter and to read the full article.